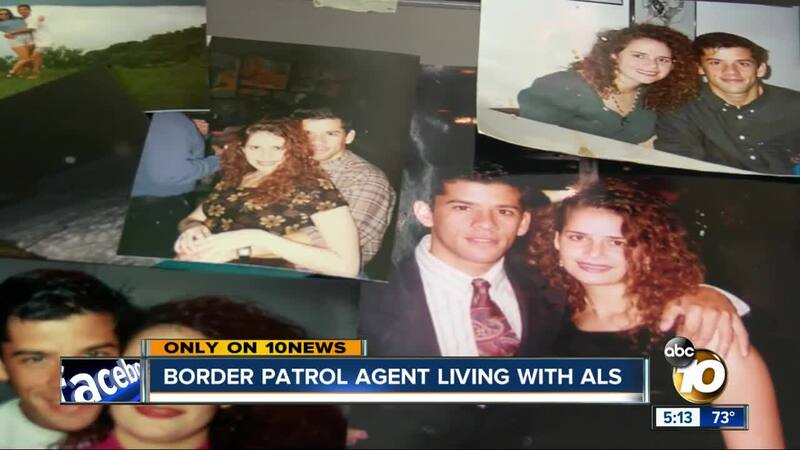 CHULA VISTA, Calif. (KGTV) - Jeff Miranda loved his job with the Border Patrol. His entire 17-year career was in San Diego County. Now, he’s battling a deadly disease that forced him into early retirement. Jeff and Liz Miranda live in Chula Vista. In early 2015, they started to notice something wasn’t right. “He was doing a presentation at work and all of a sudden, his voice just wouldn’t project,” Liz said. They then noticed fasciculation, which Liz described as small tremors throughout his body. His speech was also becoming increasingly slurred. “We had a feeling it was something neurological at this point,” Liz said. Several months later, they received the official diagnosis. It was ALS, or amyotrophic lateral sclerosis. It is also often called Lou Gehrig’s disease. It is a progressive neurodegenerative disease that affects nerve cells in the brain and the spinal cord, according to the ALS Association. “We were… somewhat psychologically prepared by the time he got officially diagnosed because we had already suspected it for a couple months,” Liz said. Liz said, however, it was heart stopping when they first found out ALS was a possibility. “Your mind [goes] a million miles an hour,” she said. Jeff, an avid cyclist and outdoorsman, is now confined to a wheelchair and uses eye gaze technology to communicate. “As horrible [as] ALS is and given that there is still no cure, I feel very lucky about today’s technology. This computer device and the chair didn’t exist before. Both devices have been an enormous help to me and my family,” he said. They have made modifications to their home, including a wheelchair ramp and lift. Liz said Jeff still has his sense of humor and is the same person cognitively. He joked that he charges five dollars for a ride in the wheelchair lift. “I think that sometimes people will see him and talk to me and ask me questions for him,” Liz said. “He can answer you. It just takes a second to respond.” There is currently no cure to the disease. The average survival time is 3 years, according to the ALS Association. About 20 percent of people with ALS live five years, 10 percent will survive ten years, and five percent will live 20 years or more. “I think on a whole, we want to continue living our life. It’s all about attitude really. We could be sitting here miserable and then we’d miss out on the time that we have,” Liz said. There was one moment during the interview that brought tears to the couple. That was when Jeff spoke about his wife’s support. “The real victims are my family and loved ones which has been my biggest struggle living with this disease. My wife has been the most positive person that I have ever met. Having her by my side always with a smile has given me enormous happiness and hope. She has always made me feel like the luckiest man in the world,” Jeff said, as his eyes started to well up. Jeff and Liz have been together for 24 years, meeting on their first day of college in Florida. They got married in 2001 and have two teenage daughters. The battle against ALS not only has emotional and physical impacts, but it is also taking a huge financial toll. Liz had to quit her job in order to take care of Jeff, who is now 100 percent dependent. They are worried about losing their home. Jeff has exhausted the remainder of his paid time off. His fellow Border Patrol agents have donated some of their time to help the family, but that is also soon running out. “We’ll have to leave California, which would be a snowball effect because we leave California, he leaves all his doctors. We lose all our friends and our family that are here, our support system,” Liz said. Liz said she reluctantly set up a GoFundMe page to help with expenses. “We’ve never had to ask for anything. Never wanted to, so that was very hard for us,” she said. “ALS has stolen my abilities to do the things I used to love, plus a million other things most people take for granted. But it will never steal what’s the most important thing in my life and that’s my family and friends,” Jeff said.